Sarah Rodman Swift was born in 1913 in an upstairs room in the house her seastruck father built at the end of a wharf in Hingham. Her sister, Agnes, was born five years earlier in Grass Valley, Calif., where their grandfather had been manager of the North Star Mine. Agnes inherited her father's love of the sea and learned to sail soon after she learned to walk. Sarah, known as Sally, loved horses and rode them from the time she was 3, from leisurely riding to jumping and dressage, into her mid-80s. "As a child, my favorite thing to do was ride horses," Sally Swift wrote in a newsletter of Centered Riding Inc., of Perkiomenville, Pa. "My mother, who was horse crazy, rented a horse for a month in the summer. Mom loved horses, and she was having a great time sharing her love of them with us." She founded the nonprofit at age 62 and named it for the mind-body method she developed to make riding as pleasurable as possible for rider and horse. In 1985, Ms. Swift wrote "Centered Riding," a book based on her method. Her "Centered Riding 2: Further Exploration" was published in 2002. Ms. 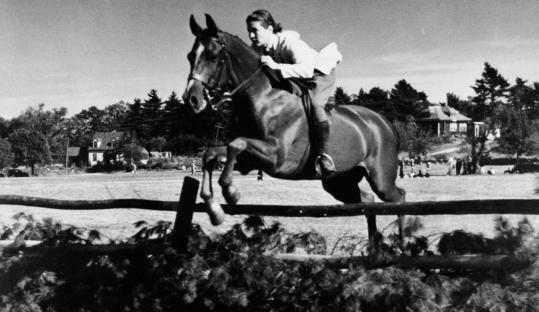 Swift, who became known internationally for the centered riding method and whose books, in 15 languages, have sold some 900,000 copies worldwide, died April 2 of pneumonia at Brattleboro Memorial Hospital in Vermont. She was 95 and lived in Brattleboro. Sally Swift had many remarkable facets, friends said. At age 7, she was diagnosed with scoliosis, a lateral curvature of the spine. She rode wearing a full back brace from the time she was diagnosed until her 70s, when she had back surgery. She rode with the brace, skied with it, and wore it when she rowed with her sister in Maine. In one of her newsletters, she wrote that scoliosis had led her to centered riding. Her mother, she said, had taken her to the physiotherapist Mabel Ellsworth Todd, author of the book "The Thinking Body." Ms. Swift explained Todd's point of view in a newsletter: "You could control parts of your body and reach muscles with your mind when you couldn't direct them with physical movement." Todd became her teacher and mentor and encouraged her to ride to strengthen her lower back muscles. At 62, when she retired after 21 years working as a records manager with Holstein Association USA in Brattleboro, she taught riding to her friends, and started teaching the centered riding method. "Sally used some concepts of her therapy with and insights from working with Mabel Todd to develop the four basics of centered riding," said Munson Hicks of Vernon, Vt., a longtime friend who first met Ms. Swift at horse events when he was a youth. Centered Riding's website lists the four basics as "soft eyes," a habit of visual and physical awareness; proper breathing; centering, in which the center of balanced movement and control, located deep in the body, gives great strength, harmony, and power; and balance, aligning the rider's body with that of the horse. Lucile Bump, who met Ms. Swift when Bump was 14, is a centered riding instructor on Bump's farm in Guilford, Vt.
Bump has taught centered riding in "10 different countries," she said. "Some of it has aspects of martial arts, and it teaches you how to be strong and soft at the same time." That, in a way, friends said, described Ms. Swift. Though she was just 5 feet 2 inches tall, Ms. Swift was not intimidated by unruly horses. Instead, friends said, she had a great rapport with them. Hicks recalled one story of a rambunctious horse that calmed right down when addressed by Ms. Swift. "Sally was probably one of the most generous but firm women I've known," Hicks said. "Sally smiled with her eyes. They just lit up. She had a wonderful sense of humor. She knew her own mind, but was not sentimental in any way." Growing up in Hingham, one of two daughters of Rodman and Elizabeth Townsend (Foote) Swift, Sally Swift was home-schooled until she entered Milton Academy in the seventh grade. Though their father was a surveyor and engineer, he preferred to be on the water. From 1943 to 1945, Ms. Swift attended the University of Massachusetts at Amherst, then transferred to Cornell University, graduating with a degree in agriculture in 1947. Hardly a day passed in those years that she did not ride, teach, or take part in some equestrian show. She also took part in fox hunts. In the late 1930s, she was in a horse show in Medfield on her horse, Douchka, the Russian word for dearest. He was given to her while she was teaching riding at the Dedham Country and Polo Club. "I loved him dearly," she wrote. "When I got unhappy, I used to go out and cry on his neck in the barn." After she left Dedham to teach riding at Fox Hollow School in Lenox, there was a fire in the barn where Douchka was stabled. In the release of the horses, he was kicked by another horse and his leg was broken. The veterinarian confirmed that Douchka had to be put down. "I turned my head as, unbearably, my partner's life was extinguished," she wrote. ". . . The sobbing came later." Neither of the Swift sisters married. Agnes died in 2004. There are no immediate survivors. In Brattleboro, Hicks said, Ms. Swift was active in its riding club and dressage show. "Under Sally's leadership," he said, "the Brattleboro Riding Club Horse Show grew to be the largest single- horse show in the United States." Ms. Swift won many awards acknowledging her ingenuity and innovation in equine affairs. In 2006, she was inducted into the United States Dressage Foundation's Hall of Fame. She continued to teach riding long after she could no longer ride, Bump said. And, according to Hicks, she had been active until two months before she died, living at home and taking part in riding clinics to help young, new riders come to know horses as well as she did. A service will be held May 9 at St. Michael's Episcopal Church in Brattleboro. Burial will be in the family plot on Martha's Vineyard.